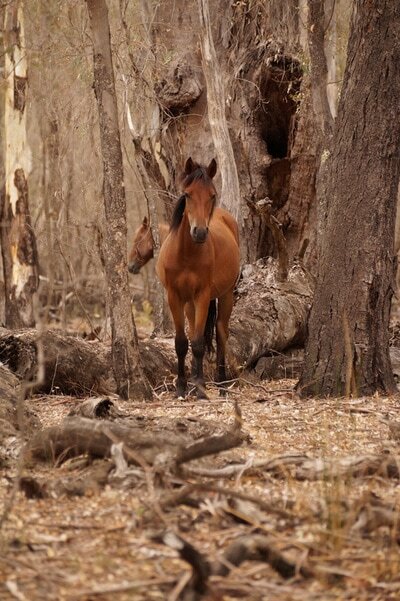 ​OverviewFeral horse levels in the Alpine National Park are at critical levels. Their hard hooves cause serious damage to the sensitive alpine environment. Without intervention, their impacts will cause severe long-term harm to the park’s special endangered native alpine wildlife and plant species. 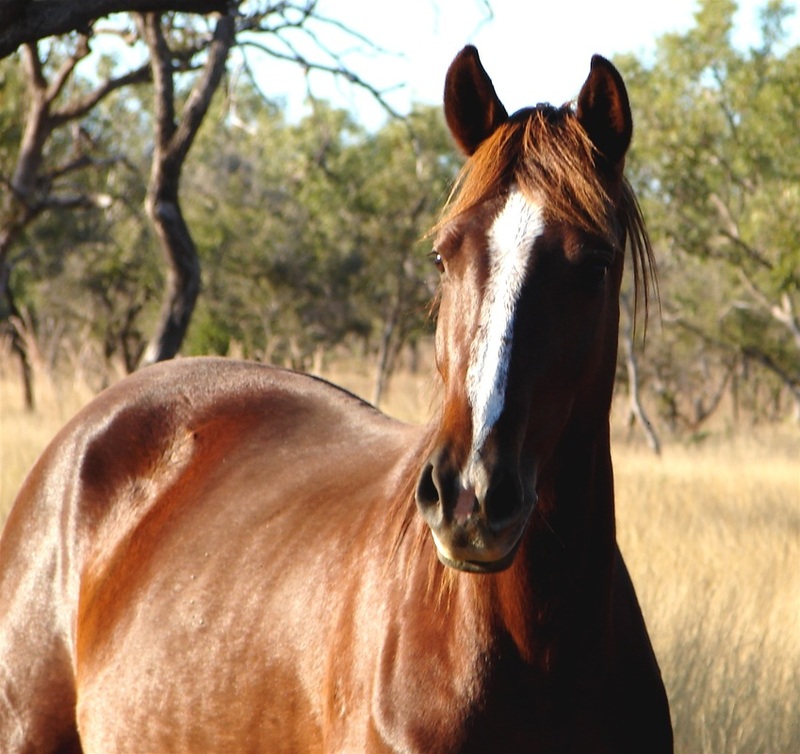 MS Word (12.42 MB)Parks Victoria’s existing feral horse removal program will be expanded in the Eastern Alps region by raising capture rates from approximately 100-160 horses per year to approximately 300-400 horses per year, over three years. As part of drafting the plan, extensive consultation has taken place with animal welfare, community, environmental and cultural groups through a series of roundtables. A Technical Reference Group including specialists in veterinary science, horse behaviour and welfare and cultural issues has also provided specialist input. Feedback is sought in the form of a survey but if you would also like to provide a written submission in the form of a Word or PDF document, use the file upload tab below. Western Australia is pioneering a method of culling wild horses to stop the destruction of one of Australia's most significant wetlands. The Fortescue Marsh, about 250 kilometres south of Port Hedland, might occupy some 900 square kilometres, but it is small enough for the estimated 1,000 horses to do damage. Parks and Wildlife conservation officer, Hamish Robertson, said the Fortescue Marsh needed to be protected from the animals. "The marsh has a lot of very special plants and animals with high conservation significance," Mr Robertson said. Aside from their effects on the marsh, wild horses are also known to affect pastoral stations. 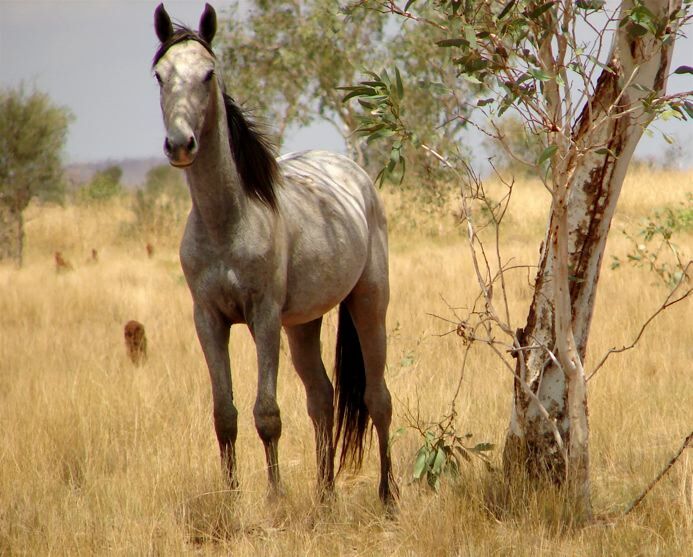 Kimberley Pilbara Cattlemen's Association president, David Stoate, said the impact of wild horses could come at a considerable cost to pastoralists, as well as the environment. "It's a lot of grazing pressure, as well as their affect on water points, water holes, and natural water courses, the affect of them can be quite severe," Mr Stoate said. Following an aerial survey of the Fortescue Marsh in 2014, which showed tracks across the marsh leading to waterways, heavy erosion and wallowing, caused largely by horses, Western Australia's Parks and Wildlife service began tracking the horses. Using a light tracking collar with VHF and satellite beacons, which pinpoint the horses' locations every two hours, peak activity times, and temperature, Parks and Wildlife was able to find out how far the horses were roaming, and why. Hamish Robertson said the idea was to eventually install a fence around the marsh, however he believed it was important to first reduce wild horse numbers. What a busy past 12 months for all who work in conjunction to save our Wildies for a better future and the battle to retain our Heritage for generations to come. Before i go on i will highlight the meaning or the word Heritage and why we use this to refer to our wonderful wild horses Brumbies. Many Groups are fighting for change as areas of Australia are cleared of the amazing animals reminiscent of the past. many will argue the validity of their worth and right to remain in our Country, very few hold connection and loyalty as the many men and women who fought for a freedom un compared to other countries in the world. Our leaders have painted the picture of feral waste, of destruction to our Eco system, non native, inbred Pest, to any horse lover the question is how can such a gracious friend and servant a passive grazer create such animosity in a country the built its reputation on the word Freedom , the man from Snowy River, we utilise the very image to promote events and have done for many years. I can rave on for hours on all the fores to make my argument stand but it wont change a thing in my life time, But i pray that the next generation can have clear vision to see what they and the generation before will loose if sense does not prevail. tradition: a national heritage of honor, pride, and courage. birth; an inherited lot or portion: a heritage of poverty and suffering. the heritage of the righteous. visitors to a heritage site in the Middle East. than those seen for feral North American populations. 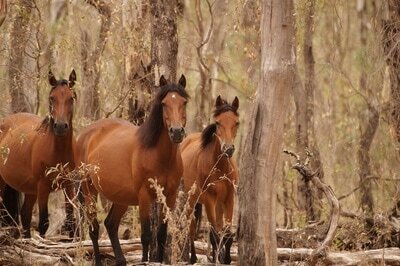 home message however, is that genetic diversity in the Brumby as a whole is at healthy levels. Only more detailed analysis will inform us about individual populations. assured if the brumby is allowed freedom as nature insists. important to Australia, the Waler and Timor Pony. These results are shown in Figure 1.
means more work to be done. to fully understand the structure of the individual Brumby populations. horses whilst diverse, do not represent a specific area. public lands in the and it can readily be applied to the Brumby. endangered wild and feral horse populations. Anyone wishing a copy of the full initial analysis can contact me. 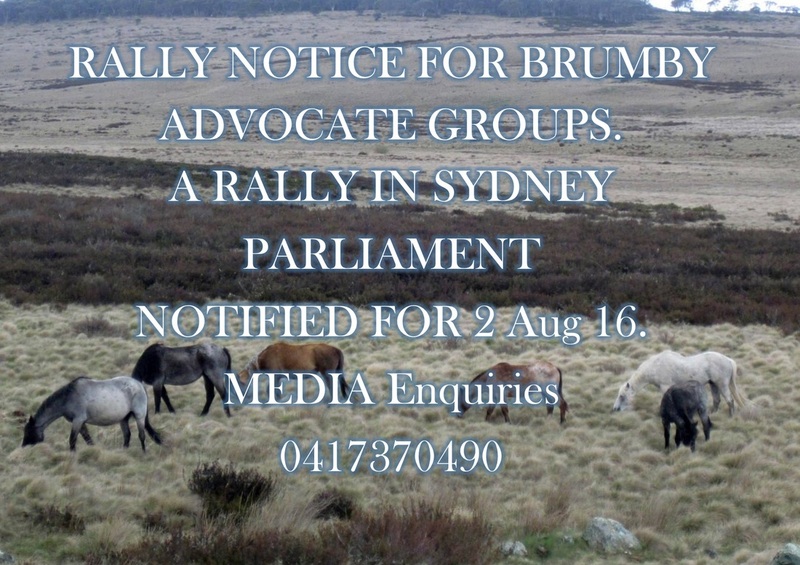 HUNDREDS of brumby advocates opposed to a draft plan to cull wild horses from the Snowy Mountains will bring their protest down from the mountains and into the city, with a rally at NSW State Parliament on August 2.
save the Snowy Mountains brumbies. sustainability and management group and chaired by president Alan Lanyon. ​Details at this point are as follows, but those attending should follow this site for changes should they need to occur. 0930. Supporters meet in the Domain on Hospital Rd only 3 horses (Brumbies) will attend with one vehicle and 3 HAL Float. There is no parking in Hospital road. Parking available at publuc carparks. Toilets available in Parliament House through front entrance. Food avaailable across the road at Black Rose Cafe. 1030. Supporters walk via Hospital Rd to Macquaries St with horses. PA system will be in place with speaker rostrum. 1100 to 1200 Speakers tba but hopefull John Barilaro MP and Premier have been invited. Note. A request has been made through Mr Barilaros office to seek a meeting with the Premier. A letter from the Snowy Brumbies will be presented to the Premier request a "stay of execution and clemency". So supporters, you wanted some action, well here it is, your turn to act and turn up at the Rally. The Brumbies need numbers to support their case for survival. You are receiving this email as you have previously had interest or involvement in the community and stakeholder engagement process for the Kosciuszko National Park wild horse management plan review. In response to a number of submissions and representations from both stakeholder groups and members of the community, the exhibition and submissions period on the Kosciuszko National Park Draft Wild Horse Management Plan has been extended a further 6 weeks, with submissions being accepted until 5.00pm Friday 19th August, 2016. NPWS will also host a series of community ‘open house’, information and feedback sessions in relation to the draft plan in Tumut, Jindabyne and Queanbeyan and with the extension of the exhibition period, these will now be held in July/August the dates yet to be confirmed. NPWS will also be contacting key stakeholder groups to arrange a series of briefing and feedback sessions in relation to the Draft Plan during the exhibition period. Further details of these will be notified in the near future. Community, stakeholder and media interest in the draft plan has as expected been high. Unfortunately however there is a great deal of misinformation in regard to the draft plan that has been presented in both media reports and social media. It has been wrongly represented that the draft plan proposes to use aerial shooting or recreational hunters/shooters for ground shooting as control methods for example. In an effort to better inform stakeholders and the community in regard to the draft plan a common Question and Answers section has been added to the ‘Protecting the Snowies’ engagement website. NPWS understands that this is a very complex issue, with deeply felt emotions from some members of the community. This complexity is reflected in the draft plan and the detail and length of all of the supporting reports, documents and information. To gain a greater understanding of the issue and its complexity the NPWS recommends that people read all of these documents to gain an informed opinion on the issues involved. It is simply not possible to gain this understanding from a short media article or social media comment. The extended draft plan exhibition period of now 16 weeks is to allow the public further time to digest all of the information in and associated with the draft management plan. Display hard copies of the draft plan and associated documents are available for viewing at the NPWS Office and Information centres at Tumut, Khancoban, Jindabyne, Queanbeyan, Bombala and the OEH Head Office, Goulburn St, Sydney. A PLAN to cull the wild horse population in the Snowy Mountains from 6000 to 600 — which suggests shooting them to do it — is causing movement in the high country. Brumby advocates are again gearing for a fight against environmentalists following the NSW Government’s release of the Kosciuszko Draft Wild Horse Management Plan 2016. The plan aims to protect the park environment and endangered native animals, and puts brumbies, which have roamed the area for more than 150 years, and as an introduced species are seen as feral — in the firing line. All brumby owners please take the time to support this iniative its relatively easy to do and i will give further details shortly as to where to send them to. 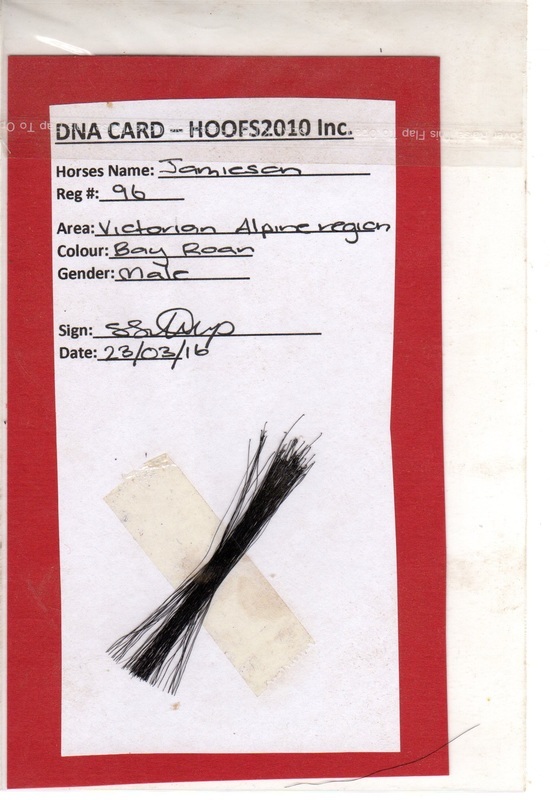 We need hundreds of Samples of DNA hair to help win this battle waged against our Heritage Brumbies by the government. 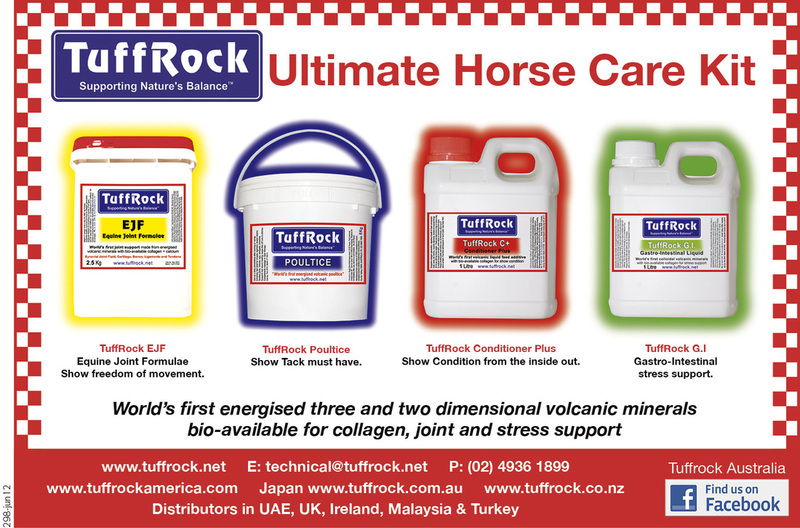 I am helping with a Equine Genetics Laboratory in the USA, in collecting horse samples from Australian horses. They will genetically test the samples and forward to an International database being complied of the worlds equine breeds. This is being run by an International group through the Uni of Copenhagen in conjunction with Genetic scientists world wide. The Australian Brumby, Mountain and Desert is on the list. We need to collect as many tail and hair samples as possible from as many areas as possible. This will also tell us as to the genetic diversity of the Brumby. It is possible that the brumby will hold a good diversity of genetics, and even have a set of rare alleles, that will provide a future seed stock for our domestic horses. I ask all groups to collect as many samples as possible. Samples of 20-30 tail or mane hair MUST be pulled and MUST have root bulbs attached, do not cut. If you want to have a firm scientific genetic knowledge of our Brumby, then this is the way to achieve that. If you want the brumby to be a part of the world equine listing, then this is the way to achieve it. Please pass this onto all brumby interest groups. I call on Mr Gibbs of the NPWS to help collect samples from Brumbies trapped in the KNP. Robb, we can do the collecting once the horses are trapped. We can collect from the trucks or yards but l ask for your cooperation please. We can do the collecting but would welcome NPWS assistance. Once samples are collected WITH gender and approx. age of the horse, Where it was trapped and date collected, l can arrange for the details of postage and paperwork to be sent to the USA. 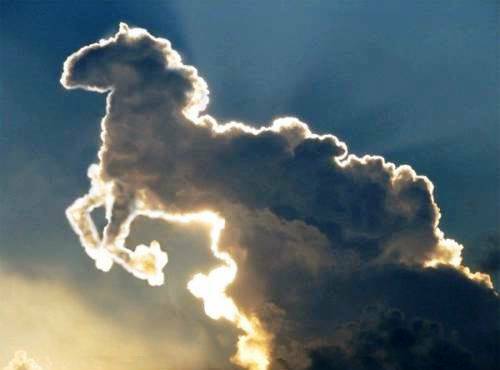 How many people know that horses running free in our world help the environment they live in? Probably not many. Most people probably see these beautiful creatures as companions, workers or athletes, but not as important guardians of our planet. The majority of the UK's wild horses are semi-feral, which means they have owners but roam free as if they were wild. The only non-owned wild horses are ponies that live in very remote areas of Scotland and the mountains in Wales. The ponies represent a number of the UK's best-known native breeds, such as the Welsh Mountain, Exmoor, and the Dartmoor. All of the wild horses living in the UK play an important role in maintaining their habitat and helping biodiversity flourish. Hoofs2010 have had a busy past few months not only caring for our residents but new arrivals have seen the work load increase, early in the year we planned to take six weanlings from a brumby removal program in the APY lands of Indulkana SA, the rescue was successful and took some months to finally receive the 6 gorgeous Fillies, yes that’s right fillies , it was just gods intervention when standing in front of a mob of 30 and selecting who would come home with you and somehow I selected fillies only, Indulkana, Maralinga, Byilcaaora, Carmeena, Mintabie and Bonybonina have settled and are doing well, all have had their feet trimmed deloused and worming program and are handling the new way of domestic life well, a few days later the phone rings again and we were asked to step up again and take a brumby Stallion and Mare from the Oxley area NSW after deliberation it was decided to take on these two as well, they both arrived and were not in a very good way, the Stallion survived and is a pleasure to work with, once his convalescence is over he will be gelded and be prepared for his new life in the world of domesticity. Unfortunatley the mare was to ill and after two days of vet work and intensive care the decision was made to lay Serephina to rest here at the Sanctuary where she is buried with River a little brumby foal who also did not survive. 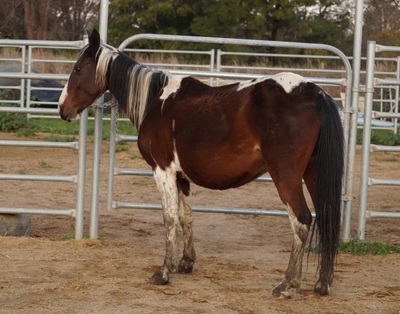 Bellebrook a pregnant mare from Celinos mob is needing Sanctuary and she is doing well. , How do we afford to do our work, well we do awareness events, we seek sponsors , we also have some wonderful like minded people who donate on a regular basis, If you can help no matter how small then its easy on our website www.hoofs2010incorporated.com we have a how you can help page. an update on Hoofs2010 Inc the past few months!! Work hasnt stopped here in Berrigan at the Sanctuary and the many awareness days we have attended to raise the profile of our Aussie icons and the risk we face of loosing them forever! We still care for our very first rescue a mob of mares who were at the slaughter yards with their of spring all born within six weeks of rescue, we also have several brumbies waiting for their human to come along and have added two extra that were at risk to our crew, Molly an 18 year old Bogong mare who has joined our old crew to live out her days and Moe who has found a lovely foster family and will leave us shortly. 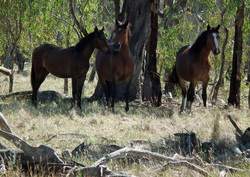 Until suitable homes are found for the remaining brumbies they will stay with us at the sanctuary in Berrigan. We also had a visit from the RSPCA last week and were ordered to erect shelters in all yards and paddocks which I am happy to say has been achieved with the great help of some dedicated supporters, so our brumbies have the very best and whilst we dislike the negativity some bring we will always achieve best practise to ensure we are doing the utmost to offer the care to a standard acceptable by the public. Our next venture is the Wild Horse Gallery the first of its kind in Australia that will see the public enjoy photographic and art work of our amazing horses as well as being able to meet some of the residents here. As this has been a life long dream the cost of this venture is the responsibility of myself and my husband as the property owners we cannot and have not used raised funds for anything other than care and campaigning to save Heritage Horses across the country. The barn will see us able to have tourist excursions throughout the week and open to the public on weekends, the visitors will be able to purchase amazing works and merchandise which will see all profits go to the Brumby cause and caring for our horses and the ability to take on new horses at risk. it will also see Volunteers have suitable amenities whilst here at the sanctuary, we will hold conferences and meetings as well as educational programs. We have also purchased a site shed that will be remodelled to allow stay over for people travelling to share our amazing Wild horses. we have had two international volunteers over the past and we would like to see more sharing the issues across the world that befall our amazing heritage horses. please enjoy the photo gallery of the past few months. Kosciuszko is another tragedy and as I type several hundred Brumbies will face their end at the slaughter house, a sad fate for the very animal who carried us through many adversity, There are few groups saving a small percentage to see a brighter future with gentle training and rehoming to suitable families, and of late several private groups are also saving what they can, unfortunately there is no funding support from our government and many struggle to meet the costs to succeed. This will absolutely floor you like it has me. I knew that a lot of the Parks Vic staff didn't like the Barmah Brumbies, but I didn't think they would stoop to this level. Below is a complaint that I have sent to Lisa Neville's and Suzanna Sheeds offices, Because I have no confidence on this being investigated by Parks Vic professionally. Please take note I have deleted certain confidential information. Subject: Inaction by Parkvs Victoria, Nathalia staff. I hope you have both been well. 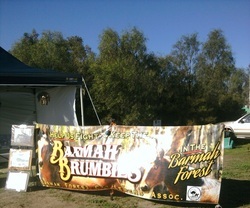 Just touching base regarding the Barmah Heritage Brumbies. Are we any closer to these horses being listed as protected and being managed properly? I unfortunately have a complaint to submit regarding some staff at the Nathalia Office. 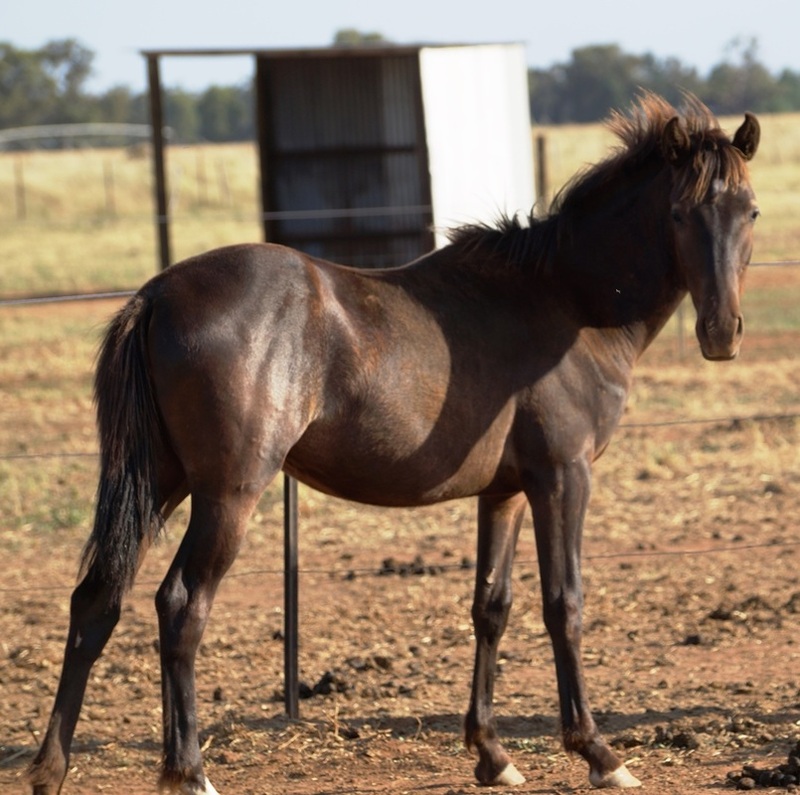 In the week leading up to the Barmah Muster weekend 25th and 26th of April, 2015, I was made aware of the fact that a Brumby mare had been shot in the Barmah National Park and a two week old foal had been taken from her. I was also informed that a Parks Ranger had stumbled across this mare when this occurred and observed a male in a utility vehicle nearby. The information that I received was that there were noises coming from the rear of the utility consistent with the noises a young foal would make. The ranger surprisingly did not approach the utility but did obtain the registration number of the Utility and observed the male with the vehicle. 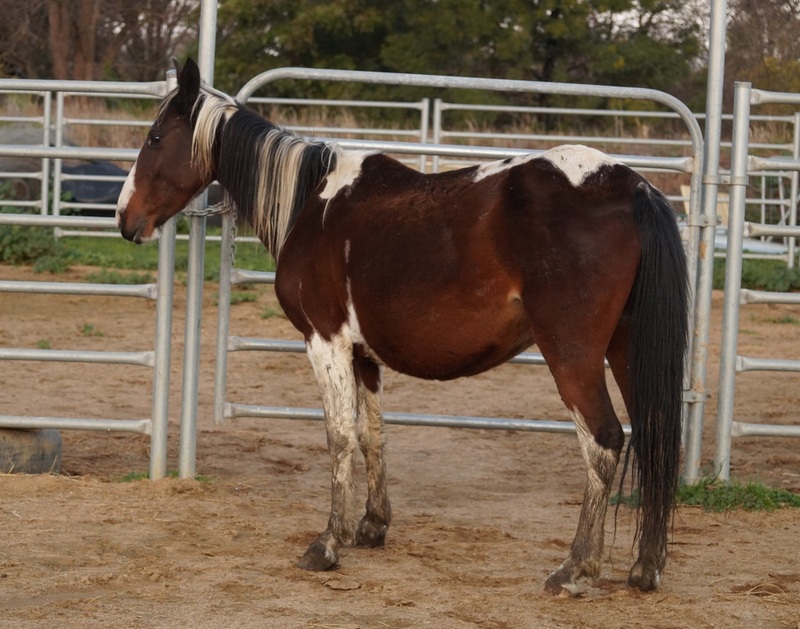 Attending to this matter professionally may have resulted in the firearm used on the mare being located, And also the rendering of urgent veterinary assistance to the foal. I was later that day informed that a male camping near the barmah muster cattle yards was in possession of a two week old brumby foal which had been attached to the shot mare. I was informed that Parks Vic staff would be attending and would seize the brumby foal and interview the male in possession. Ranger .............. had stated that the police would also be attending. Over the muster weekend I checked many times regarding Parks Vic attendance and was reassured many times that they would attend to the matter. 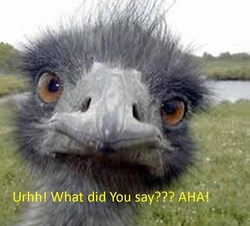 All information had been passed onto Ranger ........... Manager Nathalia Office. On the 20th of May, 2015, I was contacted by a lady who informed me that the foal in question had died after the muster and that Parks Vic had done nothing in relation to the matter. 1. the evidence of the original attending ranger including the registration number of the utility and identity of the male. the noises of the foal in the back of the ute. 2. first hand knowledge of the brumby foal being at a campsite during the barmah muster. 3. The identity of the male in possession of the brumby foal. Admissions by the male that this foal came from the shot mare. I would also submit that if Parks Vic staff had of attended and seized the brumby foal, They would of had evidence of that male in possession of that foal, They may possibly have had a confession to the crime, They may possibly have located a firearm used to kill the mare, And they would have been able to render urgent veterinary care to that foal. Blood dna testing of the foal thru a vet would have easily identified the foal as a Barmah Brumby. Parks Vic Rangers possess the training and powers to have easily handled this matter, But thru their inaction, And absolute unprofessionalism they have allowed this crime to go thru undetected. 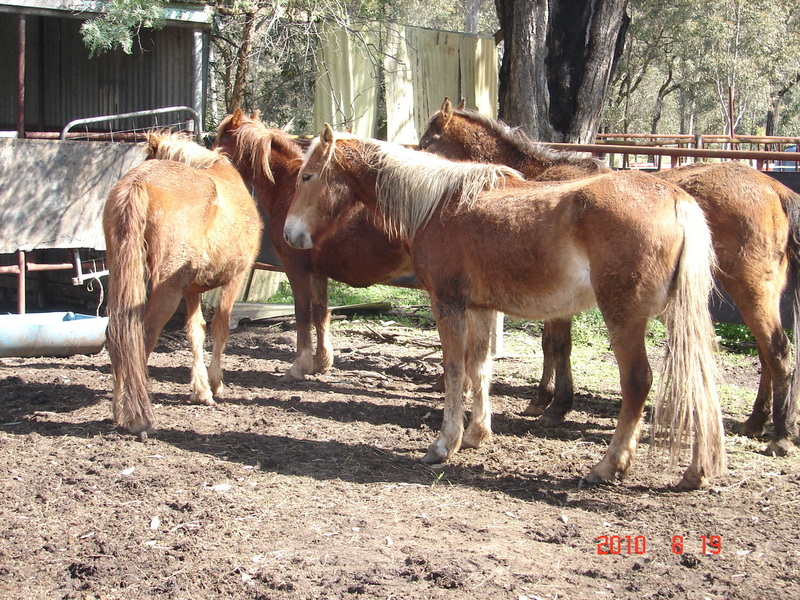 Not only was a serious crime of Aggravated Cruelty to the mare and foal ignored but it is also illegal to remove a brumby from the Barmah National Park. 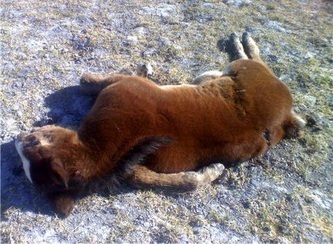 They have also thru their inaction caused untold suffering to the foal and ultimately it's death. This is bordering on aggravated cruelty itself. Ranger ................ and other Parks Vic managers/staff have displayed a total lack of interest in things to do with the Barmah Brumbies. Other matters have gone by the wayside, but this is of a very serious cruelty to animals matter and can't be ignored. I am requesting that this matter be properly investigated and dealt with. I won't allow it to be brushed under the carpet. Also of note is that I today also spoke to Ranger.............. regarding Barmah Brumbies continually escaping from the Park onto Picola North Road. I am aware that the Nathalia office had received numerous complaints about this before where motorists had narrowly missed colliding with these horses. Eighteen months ago a male driver actually did collide with a brumby in the same location. I passed onto him that on the past Monday night a local female motorist had narrowly missed colliding with the same horses. Ranger .............. stated that he had passed on the information to the local council and didn't believe that it was a Parks Vic matter. I explained to him that the horses are owned by the Crown and they are Parks Vic's responsibility. 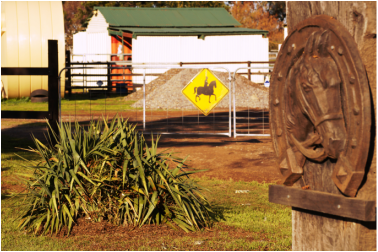 These horses are obviously escaping from the Barmah National Park because of poor fencing or an open gate. This matter has been reported to the Nathalia office many times with the result being Lack of Interest and Nil Action. 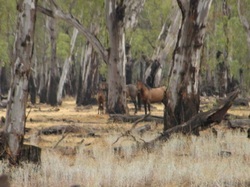 Sooner or later there will be a very serious accident involving this small herd of brumbies. This is definitely Parks Vic's responsibility and a clear demonstration of their lack of interest in managing these horses. Not only am I requesting a full and proper investigation of these complaints, But I am once again asking that these horses be recognised as Barmah Heritage horses and be protected and properly managed. The local community have been well and truly consulted, with over three thousand letters requesting the horses be protected, sent to your office. Lets stop stagnating and get this up and running. ﻿CROKER Island, just off the Top End coast, is situated in one of the most striking areas of the Northern Territory. Some 200km northeast of Darwin, Croker is separated by the narrow waters of the Bowen Strait from the natural splendour of Cobourg Peninsula. Although it’s only 8km long and about 7km at its widest point, Croker has plenty of natural assets of its own. But one of the features which first strikes visitors to Croker is something that’s not natural to Croker at all. The island is home to an incredible number of feral horses. They are immediately obvious to visitors as the road from the airport to the island’s only population centre, Minjilang, passes through a large area of wetland. The Barmah Brumby Preservation Group Inc Have been working non stop to save the last 130 Heritage wild Horses in the Barmah National Park Victoria. The horses have been in the forest since the early 1800's and are the remnants of a time long gone in Australian European settlement. Murray Willaton President of the BBPG along with other committee members have been attending meetings and liaising with other groups to build a strong united team to help retain the history threatened with removal by Parks Victoria. SMHRA would like to thank Member for Monaro John Barilaro for his integrity and hard work and who together with Environment Minister Rob Stokes today ruled out aerial culling as wild horse control methods in Kosciuszko National Park. 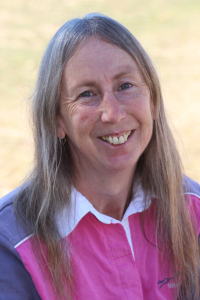 Leisa Caldwell from the Snowy Mountains Horse Riders Assoc (SMHRA) stated "It is great news that our iconic Snowy Mountains brumbies have been given a reprieve from unnecessary and inhumane massacre. The government has only partly honoured this agreement however as they need to include all shooting and make it permanent as they had previously agreed. The Minister and NPWS so far, have not consulted any experts on wild horses or professional horsemen with the specialised expertise and knowledge to be able to rule in or out any other methods of management. 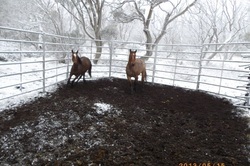 We look forward to further negotiations with the Minister to have our beloved brumbies recognised as a part of the cultural heritage of the Snow Mountains that we also love and care for and so that viable and sustainable populations will continue to roam free in the mountains as they have done for 170 years. We continue to offer to manage the brumbies as our families have done for several generations, humanely and respectfully and for free." The Member for Monaro John Barilaro has welcomed today’s announcement to rule out aerial culling of one of Australia's national icons, the wild brumby. Mr Barilaro, a strong advocate for the brumby, has fought passionately to ensure they are protected. "I have always strongly opposed aerial culling as a means of wild horse population control,” said Mr Barilaro. “Love it or hate it, wild horses are a part of the Kosciuszko environment. The brumbies are a quintessential Australian symbol; they have earned their place as part of the iconic bush heritage in this region and must be protected. “This region’s economy hinges on tourism; the Kosciuszko National Park is a major drawcard and wild brumbies are part of that. The Wild Horse Management Plan for Kosciuszko National Park will continue and a new draft would be placed on exhibition in mid-2015. 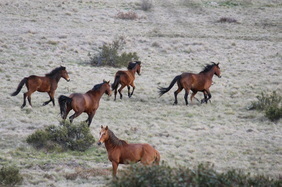 “There are few places in the world where wild horses can roam freely; I am pleased the NSW Government is committed to finding an acceptable way to protect this unique landscape while maintaining a sustainable wild horse population,” said Mr Barilaro. For more information on the review of the Wild Horse Management Plan for Kosciuszko National Park visithttps://engage.environment.nsw.gov.au/protectsnowies. Heritage horses!! Hmm Brumby, Waler, Feral waste, Inbred, Invasive, Not native, Destructive, I could go on endlessly but I want to address some points that I have learnt along the way. What do I see?? I See a connection to the very backbone of our country, I see strength and heart, I see qualities that are chosen by natural selection, I see an asset that belongs to every Australian, spiritually, physically, I see great men and stead who united fought to protect our land so we could live a life of choice and freedom, a land where we are protected from the evils of the world. I see a right to treated with humanness and respect. All these things that make us who we are, but unfortunately don’t mold us to who we should be as keepers of this land. Immigrants come to our land and we are taught to respect the ways and the traditions they hold dear! 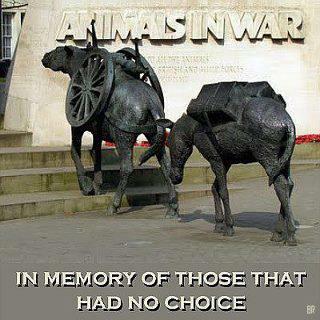 So Australia what do we hold dear to our hearts, do we honor the pioneers, the settlers, the soldiers the animals who in the hundreds of thousands lost their lives to ensure freedom. So where is my mind wandering you ask! Its heading to the wild horses of Australia, for the past for years I have watched, studied, questioned, researched, travelled, photographed, and been around one of our world’s most beautiful creations the Wild Horse the Brumby. Thousands of wild horses are eradicated every year, Aerial culling, trapping, running , and ground shot, the same process of management year after year for decades. Who cares you say, Well I do and so do many other Australians who have had the opportunity to learn about the brumby through various groups working for change and a better way. I have been privileged over the past four years through support of a great committee, the Public, and a husband who has followed my every whim for these amazing creatures to spend time amongst wild horse and help save 102 from slaughter. What have they taught me during this time? I can say with honesty I have learnt about the soul of a past the very being that gave courage and ability for those heroes to conquer the odds in all walks of life, strong, honest, family oriented, pride, resilience, character, and humility that an animal so strong in all characteristics can allow me to be in its presence. My New Year’s resolution will be a pledge to work to raise the profile of our Heritage Brumbies, to fight and advocate for a better way, to work for sustainable herds remaining where they have earned the right to stay. I will work to save as many as I can from slaughter, and campaign through all means available to stand up and speak for those who cannot. Be seen from where I stood. Who were made to watch each short life end. Of all the men who rode with me. My faithful friend will take me home. And mark our hoof prints in the turf. Gallop the spectres of your dead. You are probably aware that NSW National Parks is currently reviewing the Kozciusko National Park Wild Horse Management Plan. This Plan identifies the strategies that NPWS will pursue in order to minimise the impacts of wild horses on the park. Straight Talk has been engaged by NPWS to support them in the community engagement activities of the review. As a stakeholder with an interest in the environment, park or associated issues, we would like to formally invite you to participate in the review process. Importantly, we are also requesting that you help us in reaching your membership so we can ensure that the invitation to participate is promoted as vigorously and widely as possible. · 21st Century Town Hall meeting – this day long workshop will include key stakeholders and members of the community discussing the review questions and what should be in the new plan. Key stakeholders are invited to indicate their interest in participating by contacting Straight Talk at talk@straight-talk.com.au. Community participants will be randomly selected from across both urban and rural communities to participate. 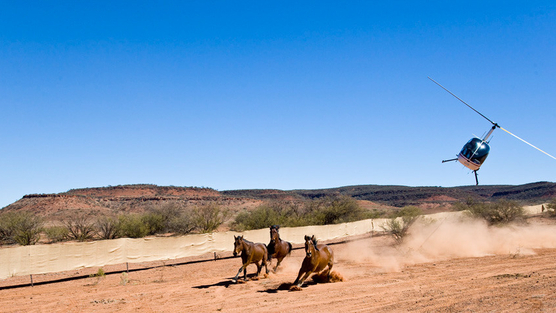 Community engagement on the Wild Horse Management Plan Review will be open from now until the end of November, 2014. An Independent Technical Reference Group is soon to be appointed to provide advice to NPWS on the review of the plan, concurrently with the community engagement. Both the findings of the Independent Technical Reference Group and the Straight Talk report on community engagement will be considered by NPWS as they develop a Draft Wild Horse Management Plan which will be placed on exhibition prior to a final Plan being adopted. Exhibition is expected to occur in May of 2015. A key question that is often asked relates to the current numbers of wild horses in the park. NPWS, together with Australian Alps Liaison Committee (a government committee with representatives from Victoria, NSW and the ACT) has commissioned a report to help determine current numbers. This was tabled to a meeting between NSW NPWS and representatives from the local Wild Horse Advocacy Groups in Tumut yesterday. It was agreed that it would be passed to all interested stakeholder groups that NPWS are dealing with as part of the KNP wild horse plan review process. Please note well, that this is a very brief summary pertaining to KNP only, from the full draft report which is still being finalised. The full report has not been approved by the Australian Alps National Parks partner agencies for general public release at this point. Once the full report has been finalised and approved for general release, I will forward copies onto all stakeholders immediately and it will be posted on the Australian Alps National Park website, and linked to the ‘Protecting the Snowies’ website. I hope that you will participate in this important process. Straight Talk is looking forward to working with all stakeholders and, should you have any questions or require further information, please don’t hesitate to contact me. · The Guardian Article generated interest as people debated what they agreed with and what they disagreed with in this comprehensive article. · We revealed the average cost of passive removal of wild horses from the National Park which drew a range of suggestions. · Horse handler Matt outlined the process of passive removal of wild horses from the National Park. · Discussion continues on what is more important to consider: the population or the impacts of wild horses. 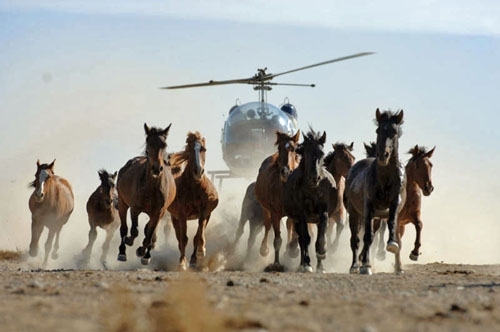 · Alex Brown from BrumbiesRUS story on rehoming the wild horses that are removed from the National Park continues to be popular. Share your experiences and views online until 30 November and help shape the next Wild Horse Management Plan for Kosciuszko National Park. Online you can access useful resources, hear from a wide range of interest groups and experts, share the conversation through social media, and find out about the review process and other opportunities for everyone to have their say. I am appealing to all friends and contacts to circulate the details and request for support. The plan is now released for public comment with written submission due by Monday, 25 August 2014. The draft plan may be reviewed at : http://parkweb.vic.gov.au/explore/parks/walhalla-h.a/plans-and-projects/greater-alpine-management-plan/resources and is the first item listed. 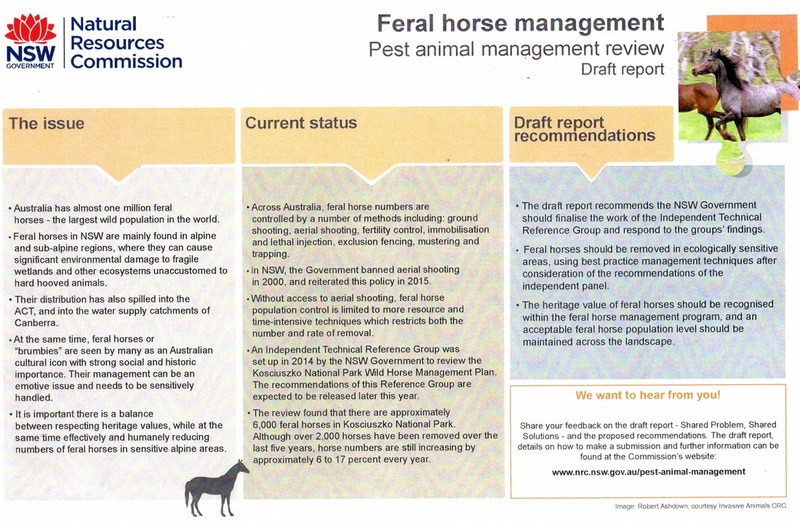 Refer to page 28 for the Feral Horse segment. It is absolutely critical that as many members and friends respond. 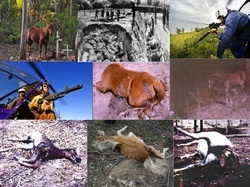 If we don't wholeheartedly and unreservedly support theBrumby there is a very strong possibility that aerial/ground shooting to control numbers will be introduced in Victoria. This will then place enormous pressure on NSW to follow. 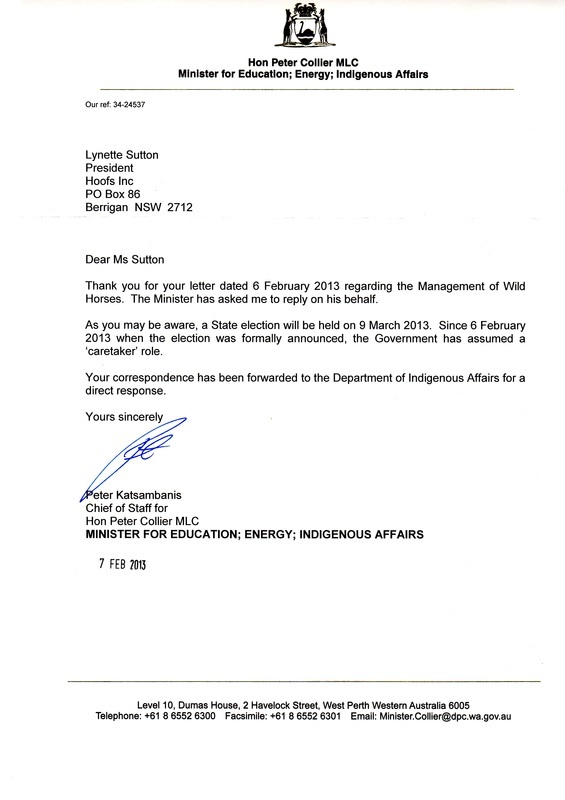 As part of the review process of the Wild Horse (Brumby) Mgt. Plan NPWS are seeking feedback from the community to gauge support (or otherwise) for the Brumby. At the following link www.environment.nsw.gov.au/protectsnowies NPWS have set up an "Online conversation" and provide 3 x Information Sheets that condemn the Brumby in no uncertain terms. You will need to click on the "community consultation about the review" link and register before you can post what we hope areongoing and supportive comments for the Brumby in sustainable numbers to remain free roaming in KNP. Also NO to any form of SHOOTING to cull numbers. As this site is being continously updated you will need to regularly open it. 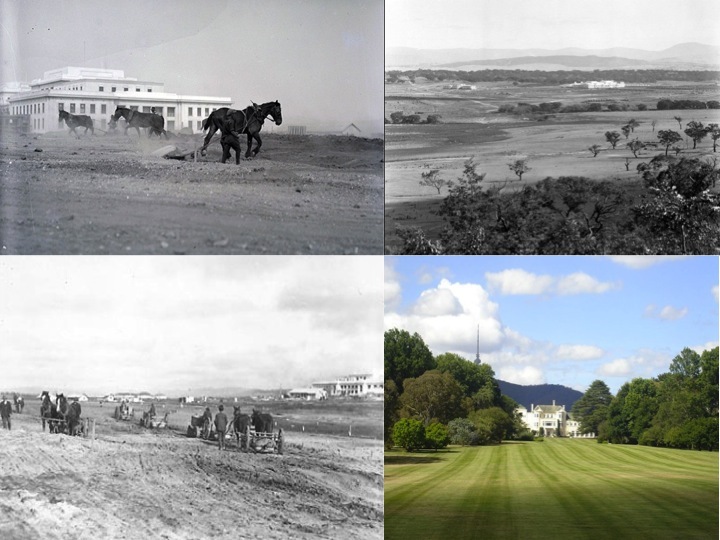 MEMBERS AND FRIENDS we must bombard this site with POSITIVE support for the Brumby otherwise the anti-Brumby forces will win. The Wild Horse Management Plan for Kosciuszko National Park is currently being reviewed and your input will help to shape the next plan. You are invited to join the online conversation which will go live from 10am today and run until November 30, at www.environment.nsw.gov.au/protectsnowies. Online you can access useful resources, hear from a wide range of interest groups and experts, join the conversation through social media, and find out about the review process and other opportunities for everyone to have their say. New conversation topics will start each week in the online social media component of consultation for this review. Born and bred in Australia, MP John Barilaro is from the same region as the brumby. He knows all about The Man From Snowy River first hand from his upbringing as a immigrant whose family arrived in the country nearly 15 years before the film was made. He now represents the constituency of Monaro who still live the tradition of oneness with the land, which includes caring for all who depend on it, including the brumbies. HIGH in the snow-capped Victorian Alps, the deafening clatter of mountain brumbies and the chug of 4WDs are heralding an era of change. Tourism is king in the Alps where the push is on for more wilderness retreats, expanded 4WD tracks, and walking and hunting trails. But with such development of pristine national parklands comes the battles between adventure tourists, bushwalkers, conservationists and hunters. Parks Victoria parks planning manager Brian Doolan said any development would still leave most of the park “very remote and very unmodified’’. “There are other areas where there’s a real opportunity to give people the chance to experience the parks,” he said. Tom Smith, who operates a 4WD and limo tours business from Bright in the Alps’ foothills, believes an expanded tourist flow can be easily managed with good roads and tracks. But in the rush to manage the remote and vast area — 900,000 hectares extending 250km from east to west — comes the growing problem of feral horses. 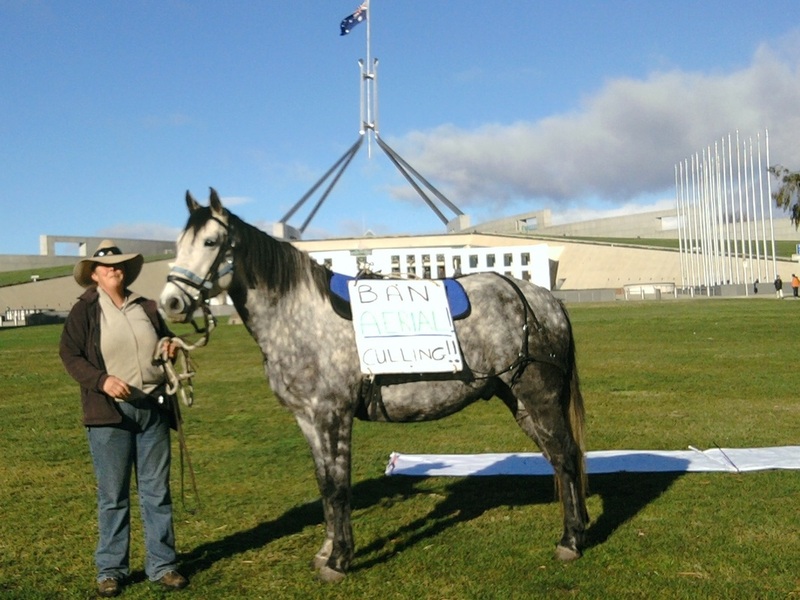 July 7, 2014, 6:29 a.m.
﻿With the current Kosciuszko Horse Management Plan of 2008 now under review brumby supporters are speaking out against aerial culling. The plan outlines the way that brumbies are managed in the Kosciuszko National Park. President of the Snowy Mountain Bush Users Group Peter Cochran wants aerial culling taken off the table. “Around 30 per cent of the brumbies are being trapped and rehomed which is the most humane method,” Mr Cochran said. 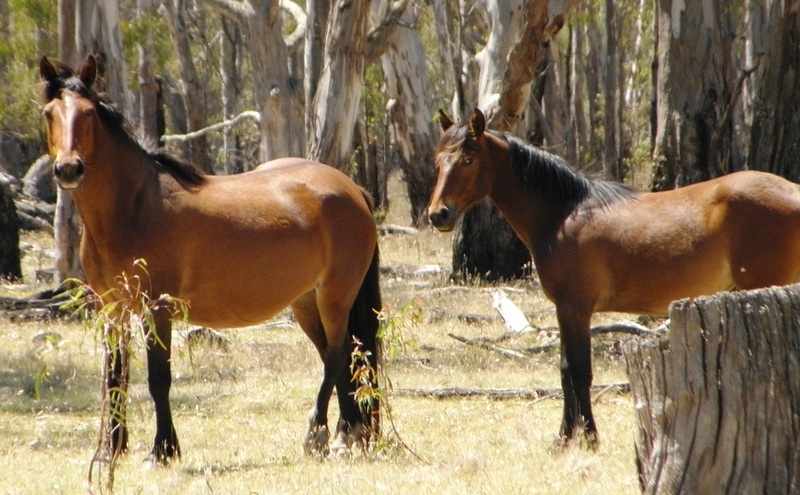 The Member or Monaro John Barilaro has strongly reiterated his position against the aerial culling of one of Australia's national icons, the wild brumby. His comments come as a review of current Kosciuszko Horse Management Plan of 2008 is underway. Mr Barilaro says the brumbies are a quintessential Australian symbol; they have earned their place as part of the iconic bush heritage in his region and must be protected. 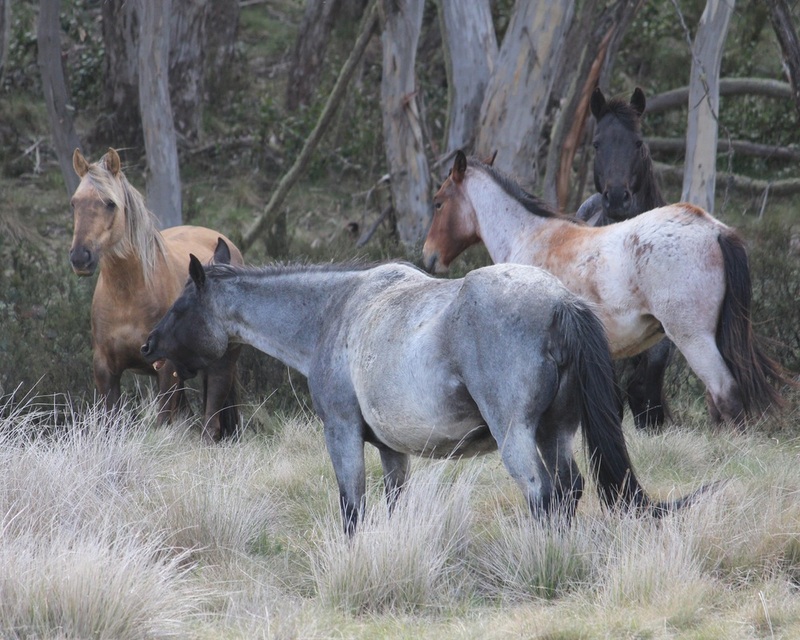 “Love it or hate it, wild horses are now part of the Kosciuszko environment and I will passionately fight any move towards culling,” said Mr Barilaro. “Kosciuszko National Park exists to protect the unique environment, that unique environment includes the wild brumbies. Mr Barilaro said there are few places in the world where wild horses can roam and are a draw card for tourism. He says the control current method of trapping and re-homing wild horses makes sense and works well. “Brumbies are cultural icons, allowing them to be slaughtered is unacceptable; to even consider this inhumane method extremely distasteful,” said Mr Barilaro. Mr Barilaro said he will continue to urge the NSW Government to support his stance. “I look forward to discussing this issue in depth with the Environment Minister Rob Stokes,” he said. Wild horses are out of control in the Australian Alps according to conservationists, and doing irreparable damage to the fragile alpine environment. 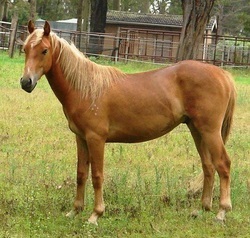 However, brumby advocates dispute the claims and say alpine horses are part of an iconic bush heritage that must be protected. Aerial surveys of the wild horse population in the Australian Alps, including Kosciuszko National Park between 2003 and 2009, indicate an increase in brumby numbers, from just under 2, 500 to over 7,500 horses. With recent good seasons and an estimated population growth of between eight to 20 per cent every year, NSW National Parks are projecting that a conservative estimate, would put the current horse numbers in the alps at over 10,000, with over 7000 in Kosciuszko National Park. Conservationists say environmental destruction in Kosciuszko National Park is at crisis point, with threatened native animal and plant species at risk. They want the population to be aerially culled. Advocates for these wild horses of the high country reject the population estimates, the claims of lasting environmental damage, and say they will vehemently fight any move towards aerial culling. Snowy Mountains brumbies: part of the landscape or destructive pest? | POLLBy Albert McKnightJune 19, 2014, 4:40 p.m.
A SNOWY Mountains horse management group is concerned the NSW Liberal/Nationals Coalition Government has not honoured its agreement in initiating a new brumby management strategy for Kosciuszko National Park (KNP). A memorandum of understanding (MOU), signed by Liberals Peter Debnam and Nationals Andrew Stoner, and a coalition of NSW horse riders dated November 20, 2006, sets out the agreements reached by the groups. 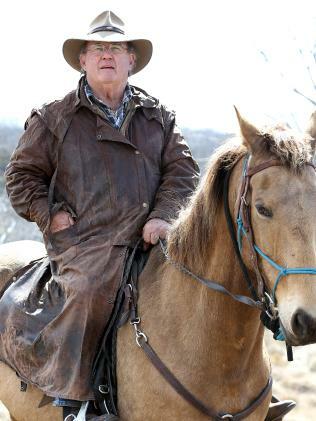 President of the Snowy Mountains Brumby Sustainability and Management Group (SMBSMG) Alan Lanyon said the most important clauses regarded the rights of horse riding for recreation, and care and protection of horses. * Clause 2a states the removal of the prohibition against horse riding in Wilderness and Nature Reserves within three months of coming to government. * Clause 2b concerns adopting a new plan of management in six months of government to reinstate horse riding to all reserve areas previously been permitted, prior to being classified Wilderness or Nature Reserves. * Clause 10 seeks to recognise brumbies as part of the cultural heritage of NSW, protection viable populations and outlawing shooting as a management tool. Mr Lanyon said the “issue had been trawled over for years” and there was “no more science to shed light on the issue”. Since Europeans came to the areas with their horses 160 years ago, he said the horses had adapted into the biodiversity. In a recent field trip to the southern end of the KNP with National Parks and Wildlife Service (NPWS) rangers, Mr Lanyon said he found “no degree of damage” or population size that had been previously claimed – and estimated there was around 500 brumbies in the area. According to Mr Lanyon, claims brumbies impact on the native biodiversity, by such factors as spreading weeds and compacting soil are just “generic claims”. He said they do not compact soil, sufficiently break down weed seeds in their digestive tract, and are “herbivores, not carnivores”. Mr Lanyon said the NPWS currently uses trapping strategies to control the brumby population, but he has concerns about how the trapped horses are treated. Mr Lanyon said there was a possibility aerial culling has taken place by the NPWS after finding horse carcases with bullets shot from obtuse angles. But he “can’t say they have done aerial culling” as a management strategy, and just wants the NSW Government to commit to banning it. “We are prepared to look at other ways of population management,” he said. He suggests this could be having an agreed number of a sustainable population of brumbies in the Snowy Mountains, keeping the population in check with a humane trapping program. Mr Lanyon said the SMBSMG had contacted members of the NSW Government such as Member for Bega Andrew Constance, Member for Monaro John Barilaro and Deputy Premier Andrew Stoner with an open letter dated June 4, 2014 however issues raised in the MOU hadn’t yet been addressed. Mr Lanyon said the best outcome for the SMBSMG would be if the NSW Government committed to a sustainable population which flowed on to a comprehensive management plan. A Community Interest Meeting will be held on July 12 at Lake Jindabyne Hotel from 1pm where Mr Lanyon said the issue of the future of brumbies will be well and truly canvassed. The Area will be closed on Thursday 19th for this purpose. The area closed will include Illawong Walk, North of Guthega Dam Wall including the Rolling Grounds. TRAIL horse riders have found two mobs of dead Brumbies in the Alpine ­National Park in North East Victoria. 120 lives will be lost if good home can’t be found for Kaimanawa horses from this year’s Department of Conservation muster. 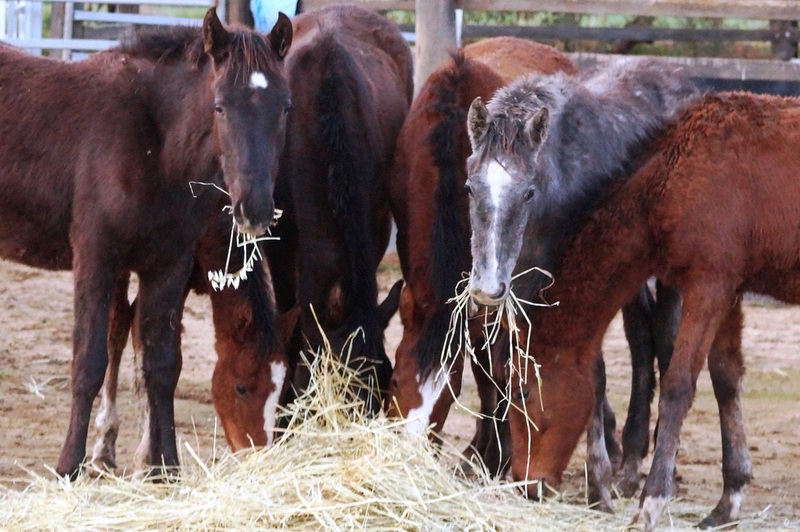 180 Kaimanawa horses are to be removed in the muster and the Kaimanawa Heritage Horses Welfare Society is seeking suitable homes as an alternative to the horses going to slaughter. removal of excess horses necessary. The Kaimanawa Heritage Horses Welfare Society works closely with DoC to rehome as many of the wild horses as possible but those that don’t find homes, go direct to slaughter. Kaimanawa horses have shot to fame in equestrian circles since the last muster in 2012. They’ve earned their celebrity status by proving both trainable and talented. Some that were mustered and rehomed in 2012 are already out competing and winning in open competition. 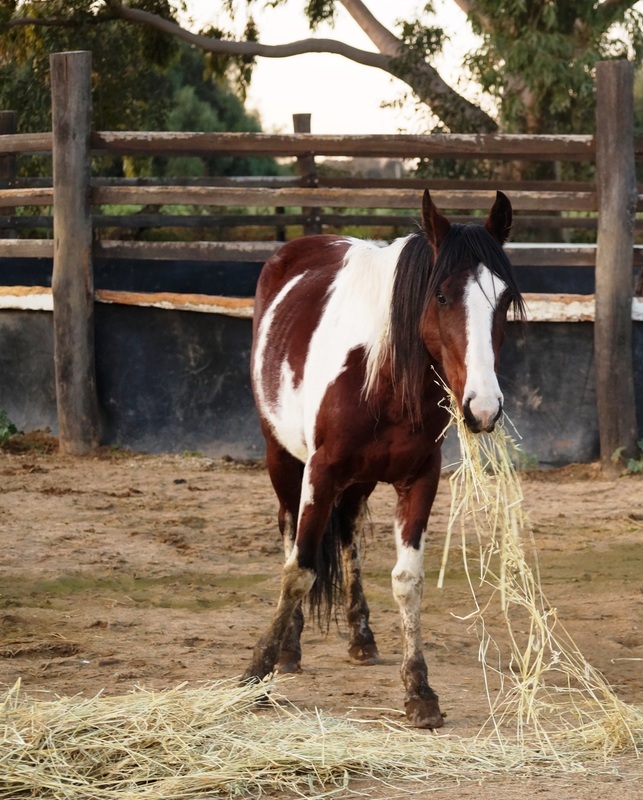 These horses have nspired a number of discerning horse owners to consider taking the plunge and adopting a wild horse but many more homes are needed for the 180 stallions, mares and foals that will otherwise be trucked straight to the abattoir from the muster in late May. 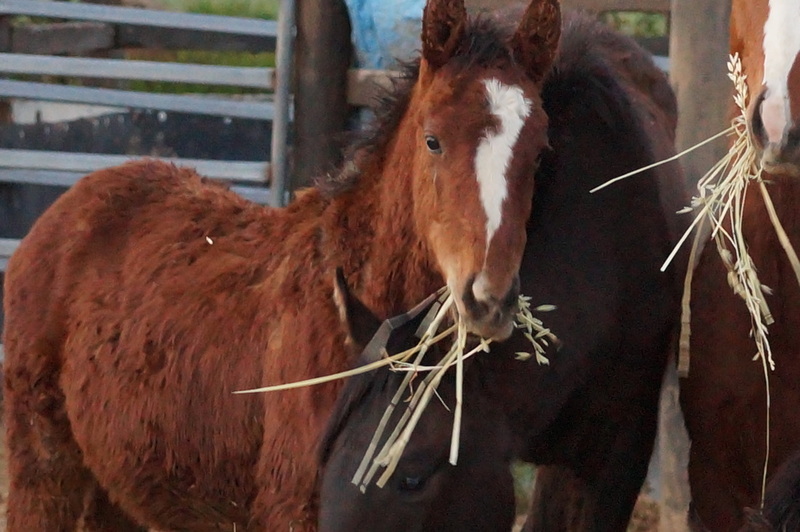 Kaimanawa Heritage Horses commits to taking on all of the unplaced foals and yearlings, but horses as young as two years and everything older, are all facing the abattoir unless more homes are found. Kaimanawa Heritage Horses have applications for approximately 60 of the 180 horses but need to more than double that number, in less than 2 weeks. 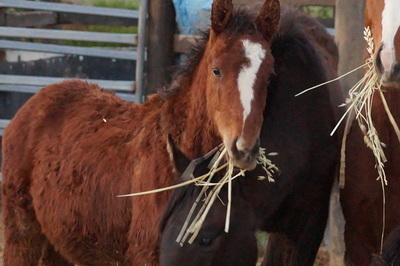 Applications for adopting a Kaimanawa horse from the 2014 muster will close on April 30th. 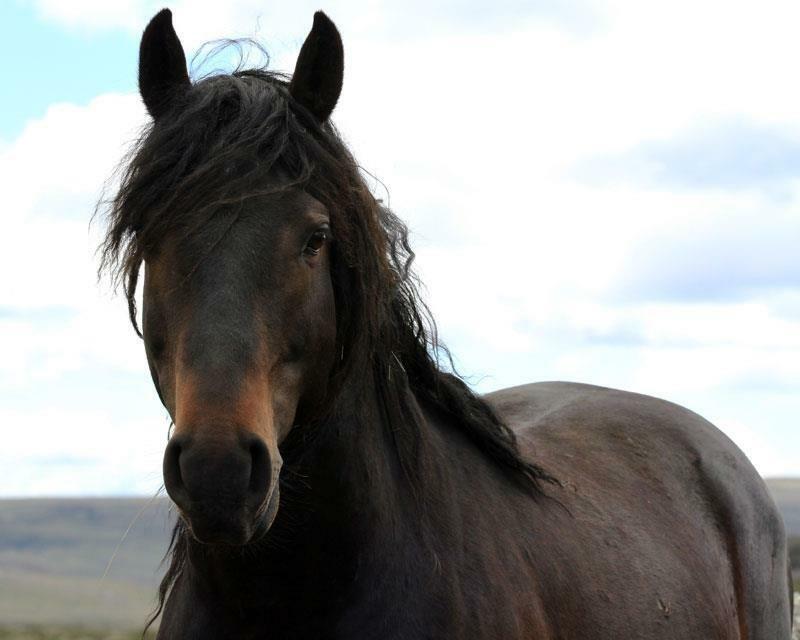 Application forms and further information can be found on http://kaimanawaheritagehorses.org/ and https://www.facebook.com/kaimanawaheritagehorses or phone 09 431 6111. "Hoofs2010, while saving brumbies headed for slaughter, are also working toward providing plans to government for environmentally sound, cost effective and humane solutions to the limiting of brumby numbers in the wild and most importantly their removal from the Feral Animal Register. We are also working toward building a working station where visitors can come spend time with the brumbies we have rescued and worked with and eventually be able to be hands on with the brumbies in residence so visitors can experience the satisfaction of helping to protect the horses that helped to build our country. We are currently working on compiling factual studies on the exact numbers in the areas we are dealing with along with the actual environmental effect of the brumbies in these areas." The first 'Australian Brumby Challenge'!Final Event:The final competition weekend is on the 1st and 2nd of February 2014, at the Victorian Equestrian Centre in Upper Beaconsfield.After the awards ceremony on Sunday the 2nd of February 2014, all Brumbies will be auctioned to registered and approved bidders. Please note that there will be EFTPOS/Credit Card facilities available throughout the weekend including the Auction. Click Picture to Visit the Website for more Info!! A brumby sanctuary will trial a contraceptive vaccine on its horses this year, in the hope that the NSW National Parks and Wildlife Service will enlist the technology. Currently, as part of an ongoing pest management plan by the Parks and Wildlife Service, 80 horses are trapped in Guy Fawkes River National Park in northern NSW each year and re-homed. 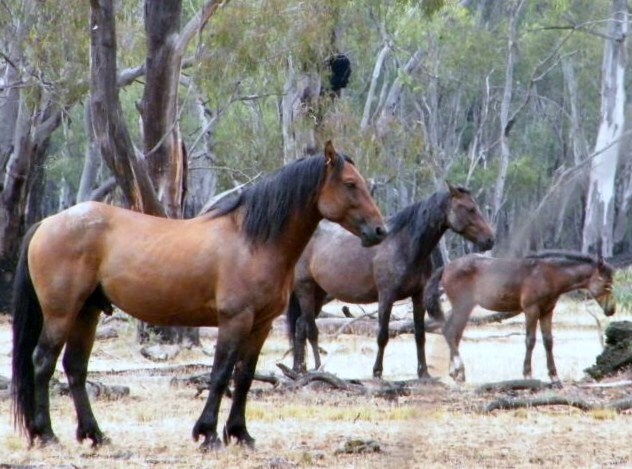 New England Brumby Sanctuary Founder Jan Carter says if the fertility control is successful, its use would save the government money, and would eliminate any threat of aerial culling. "We want to contain breeding (at the sanctuary) and it's our hope, in a few years time, to convince the government to start using fertility control in parks which will be a lot cheaper in the long-term than trapping them and pulling them out. "We'll be using the drug PZP," said Ms Carter. "You can dart the mares remotely so you can select the mares you want to dart. "A single dart renders the mares infertile for up to four years. "It's completely reversible. Once the drug wears off, the mare can fall in foal." In a written statement provided by NSW Parks and Wildlife, the Acting Director Park Conservation and Heritage Mick O'Flynn says that $700,000 was spent on horse control measures last financial year. He says major logistical issues need to be overcome before fertility control could be considered as an appropriate management technique in the large remote areas of difficult terrain found in many national parks. But Mr O'Flynn does say that the park service is open to assessing contraceptive control methods for wild horses. He says all control methods are considered when horse control plans are reviewed. 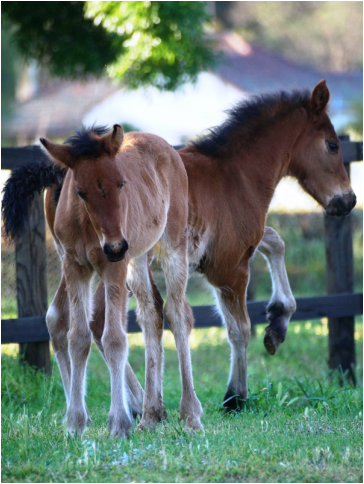 As you will be aware, Parks Victoria, in partnership with the Department of Environment and Primary Industries (DEPI), is developing a Victorian Alps Wild Horse Management Plan to guide the management of wild horses and their impacts on public land in the Victorian Alps. Parks Victoria and DEPI are currently preparing the draft Plan. The collective advice of the Roundtable Group together with public submissions, feedback from interviews with key interest groups, advice from the Technical Reference Group and survey results are all being considered as the draft plan is prepared. Once the draft plan is completed the community will again be invited to comment and make written submissions within a nominated 60 day period. You will be notified when the draft plan is available. Thank you once again for your interest in this project. Guy Fawkes 2000 when Rspca take NPWS to court on animal cruelty and drop over 200 charges to one count and now in 2013 Maria Mercurio RSPCA say we will support Aerial Culling of wild Horses again, Where is humane care of animals of all walks when a proven catastrophe such as the events of 2000 are approved to be repeated. The Australian brumby has been mythologised by authors such as Banjo Paterson and Elyne Mitchell, but they also represent a significant threat to the ecology of the alpine national parks. So how best to tread that line between managing the high country to ensure the best environmental outcomes, while not resorting to aerial culls of a horse, worse yet the iconic brumby. The Hunter Valley Brumby Association's Maddision Young says there are other, appropriate and more humane ways to reduce the brumby numbers. used as a method of control. click the picture below to sign and support to stop this method of wild horse control . Our newest Campaign we would love to see you support!! 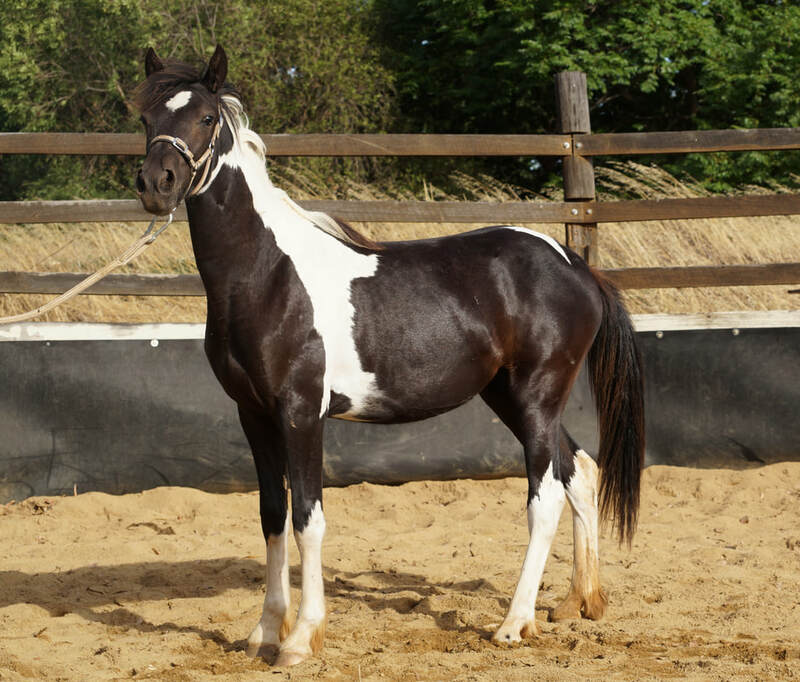 Everyhorse you see in our photos was destined to be slaughtered, as you see time and time again quality trainability and health is everyone of them, they would fit in any mould a horse owner could dream. Coloured, solid, tall, short, stocky, elegant, strong of bone. big in heart ! here on the ground, no wait, no wondering, no vet bills, Born and strong as they should be, weigh the cost of breeding your own to walking up and picking your dreams from a living soul, got to a sale and choose the horse of your dreams, its the only certainty to get what your looking for. For us it is the waste of our heritage horses we try to change, but in the reality of our country horses from every discipline are a tragic fact of the pet food and human consumption trade. 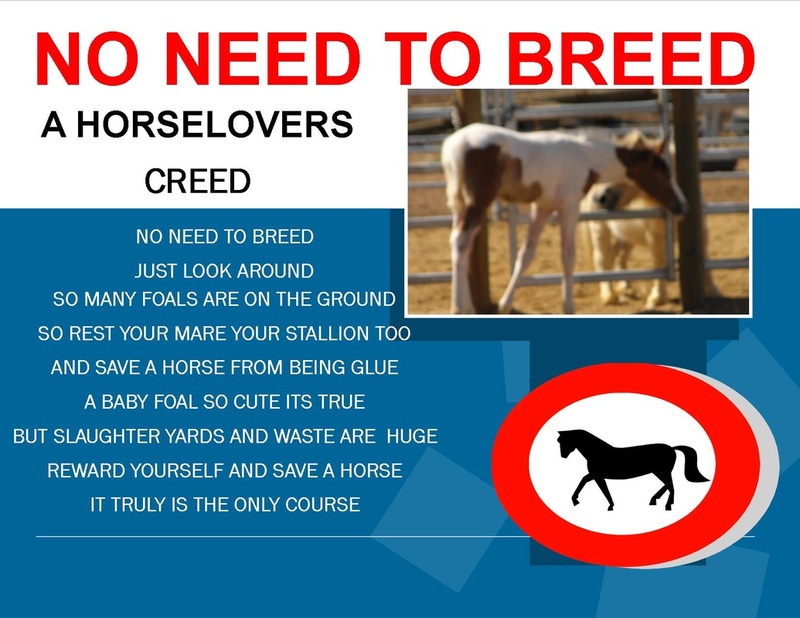 As much as its a dream we would love to see each breeder what ever the field rest one mare for one year and replace the progeny with a rescue from the same breed!!. Yes i know its a dream but wow imagine the difference it would make to so many unwanted horses. Yesterday just after Midday NT Nyente gave birth to a beautiful filly foal, Nyente had a strenuous birth and was exhausted she took over an hour to rally and when she did she did not want her baby, Mum and bub were left several hours before the little one was quite heavily kicked by her mom. it was decided to remove the little foal after 7 hours as she was weakening and needed to have a drink on such a hot day. it was 11 pm when little bub got he first taste of colostrum she was weak but heartily drank 300 mills. She was placed on hourly feeds and wasnt long for her to be snickering for her bottle. 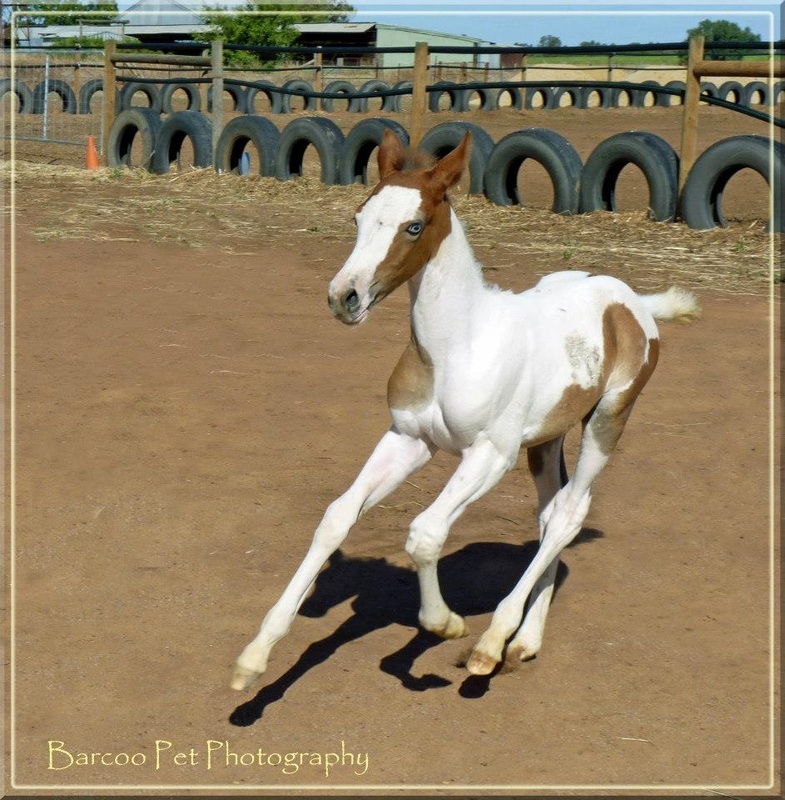 It was with heartfelt gratitude to Mr Stefan Kaempf retired stud master of Arrowfield thoroughbred stud, and Milford Park Thoroughbred stud in Ngambie for the wonderful blue blood colostrum they supplied for out little brumby girl. she is still fighting hard today and we pray for her survival. enjoy the picture album. Election time is coming in Western Australia in March 2013 a time where uncertainty for the fate of the Wild horses is in the balance. As pastoralist want the horses removed and the government state its environmental degradation . However The Pastoralist will put more cattle on the lake and we all know cattle offer nothing to the environment other than lawn mowing and economic growth for the business men. We have and will continue to lobby the WA government for better management of the wild horse situation and if it is deamed they must be removed then also all hard hooved animals should be excluded from the area. we have asked for some positive management and asked that funding be made available to rescue groups to be able to save as many horses as possible from slaughter, Funding for pest control and eradication has been available for many years, it is time funding to showcase the government has intentions to show a positive light in wild horse control and show the Australian Public that it does infact have the interest of the horse welfare issue at heart. Today RSPCA have come out in support of this request and we are lobbying for other avenues to be investigated, The wild horses of the Kimberleys share the land with cattle and it is not in environmental interest that the planned cull would be performed, it would be infact to make room for more export cattle on the land under the pastoral leases, a very sad day for Australians everywhere to see such a barbaric way of removing some fine examples of our past, Our lobbying will be to ask for culling to be banned and governments looking at ways to enhance the heritage value of the horses in WA and the morale of Australians who pride themselves in connections to a time where horses carried the country. Our petition on Change Org is to create other options such as support for groups who work entirley of funds raised by themselves, Successes are limited only because of costs associated with rescuing and rehoming, many Australians are now coming forward to adopt or rescue and Australian horse . promotional working showing the versatility and quality of our own heritage horses are being shouted across the land as more and more awareness comes to light. These issues need to be addressed with support for all ideals and the very best outcome for all living things in harmony with a living world. Western Australian Heritage brumbies are in the firing line again to make room for more cattle on Lake Gregory WA, As usual numbers have been grossly exaggerated to convince Australians a cull is necessary. Libby Lovegrove has lobbied and fought for sensibility with the government and below i have attached her letter to the government and the reply she received, Time to stand up and say enough, The people who sit in office aree elected by Australians to care for our needs and our values. I am sure if many citizens knew the actual truths our leaders sprout how long they would remain in power. The day started with a meet and greet at 9am at the Barmah Hotel the cafe next door was open and the proprietor a lovely man passionate about the beautiful heritage horses and keeping where they belong. Unfortunatley the sky opened up and the threatening storms came. so the decision was pondered and we decided we would continue with the tour. We set off at 9.30 and followed the main track . decoding it was to wet to divert from it we parked our cars and walked through parts of the forest and lake area. was not long after we found tracks big feet and one little foot close to mum. And soon there they were! a well conformed stallion and his mare and baby. They remained calm with baby having a good feed and watch full dad keeping things under control. There is no more spiritual gift than seeing what has evolved with out mans interfering hand. The battle has a long way to go to show environmentalists and government how healthy parts of the forest are where all living things are in harmony. Our beautiful lawnmowers are taking good care of their home and under the current numbers have no need for removal of any. Its not Just a place for horse lovers but the whole family have something to see or do. If you would like to attend the next planned Weekend with our group please pop your details in the contact form and we will include you in our email list for adventures related to Barmah Brumby events. In the past month Vic parks did a passive trap in the Bogong Vic, Against request from brumby groups as the time of year through spring and summer brumby mares are usually foaling down or have very young foals on them. 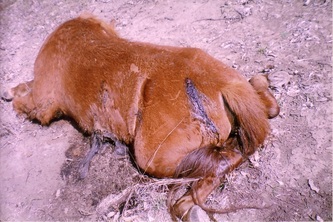 It came to light during this trap horses became ill with the admission to the fact pregant mares suffered from tetany . One pregnant mare did not survive and two others could not be transported due to the same scenario and need to be intravenously hydrated. Our group will be supporting a submission to welfare agencies and Vicparks to halt all further trapping of any brumbies during these seasons. 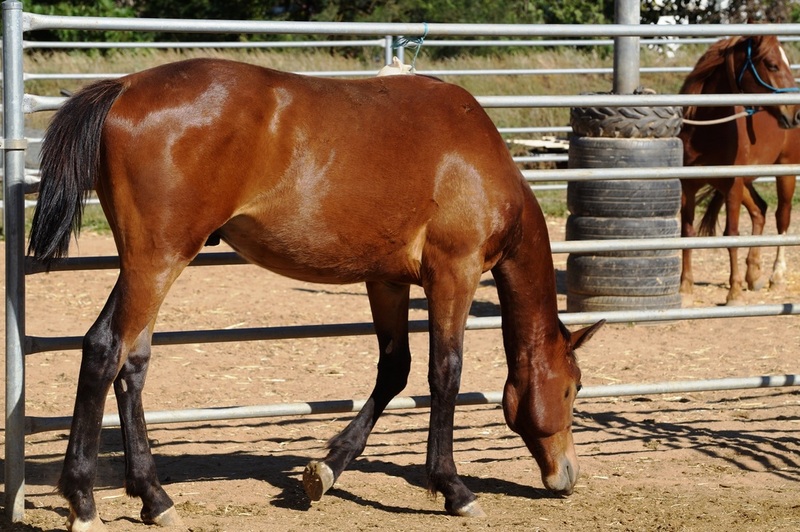 As brumby advocates and study it is observed facts that several other events are documented. Brumby mares nanny sometimes several foals. in humane trapping it has occurred that the foal mothers can stroll into traps and be removed leaving young foals without nutrition and the fate of a slow death, this has been documented to also occur the other way around. Due to the amount of stress already placed on wild horses in traps heat and adverse weather make risks much higher for animal welfare issues such as mares foaling in holding yards and on transport trucks, stress related abortions are also high on the agenda. We will work to have trapping regulated with the intentions of the living animals welfare on the highest agenda and not accept any lower standards. The events of the past few weeks should not have happened lives should not have been lost and needless stress inflicted on any living thing. There are 400-500 wild horses living over the area from Bililuna to Balgo, an area in the far east of Western Australia, mostly around Lake Gregory, a fresh water lake formed from the Sturt Creek which has it’s origins in the NT. 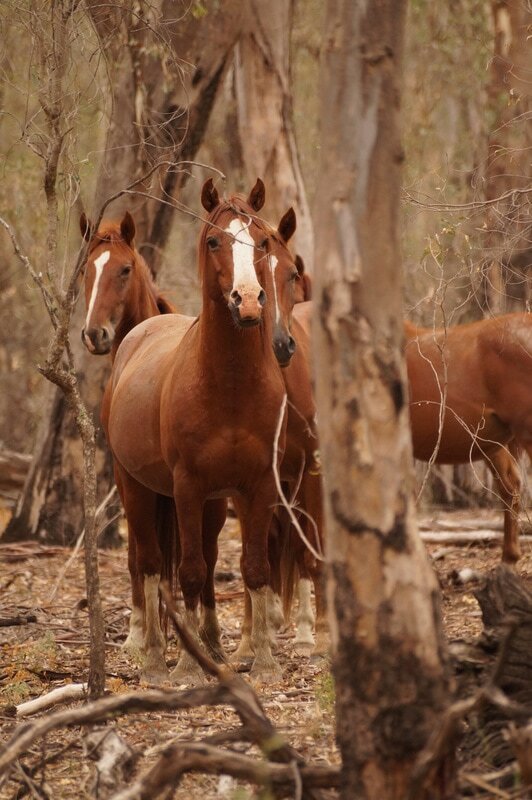 Since the Mabo decision which gave Indigenous groups jurisdiction over these wild lands, the horses have come under the Tjurabalin Pastoral Lease which is held by the Aboriginal Lands Trust; part of the Pastoral Lands Board. The two communities at Bililuna and Mulan, which manage Tjurabalin, have no income with which to manage the horses and have been pressurized in the past by DAFFWA to cull the horses for pet meat. The indigenous groups at Lake Gregory have grown up with the wild horses and love them, but have no resources to care for them or try to manage them. These horses are extremely valuable. 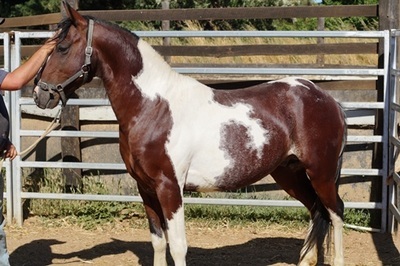 They were bred from two purebred Arab stallions, taken to Balgo Mission in the 1950s by Father John Macquire, who was something of a horseman himself. They bred with stock horses from Bililuna Station, some of which had the desired Percheron bloodlines to give them strong bones. Now the horses have been running wild for years and have developed all the strong skills and endurance physical capabilities that are so valued by the racing, endurance and jumping competitors. 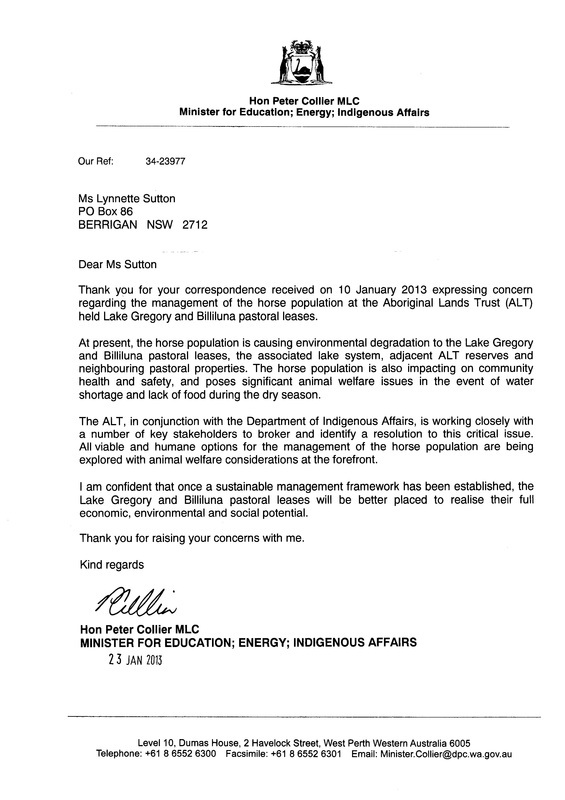 However, I have been told that the horses at Lake Gregory will soon be culled. That is any horses remaining at the lake will be shot from the air by snipers in helicopters, to clear the lake and put the area up for private sub lease. Firstly, the current lease could be taken away from the Paruku Indigenous Area people because they have not been able to run it as a commercially viable station. Without funding and training how can they? Secondly, conservationists are more intent on preserving the lake than the horses and have more power in government; although from what I have seen it’s the cattle that do all the damage at the lake. The end result will be a bloodbath, similar to what the Dept. 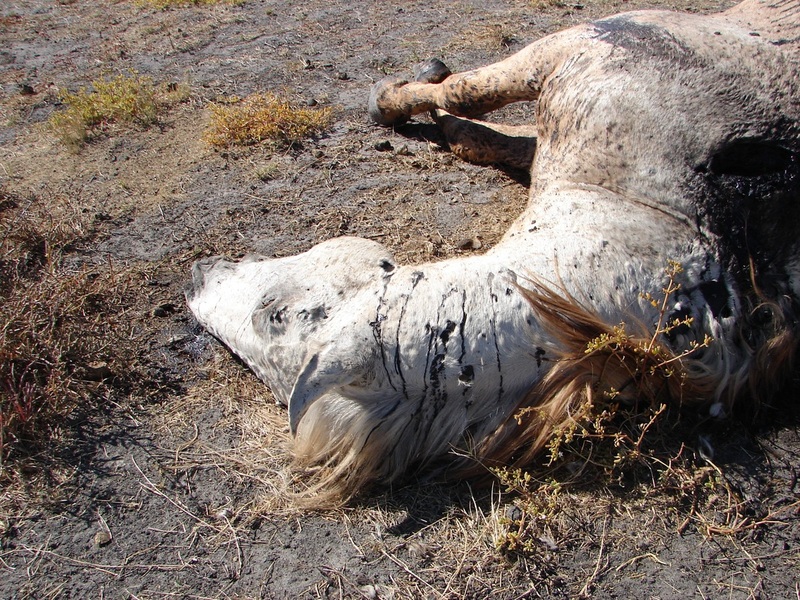 of Food and Fisheries WA did at Frazier Downs , with mares aborting foals and dying in agony, foals cutting up their legs and bleeding to death and stallions running headlong in to trees and lying for days in pain before dying. I have photographic evidence of this mindless, cruel slaughter and, though it was presented to a meeting of Dept. 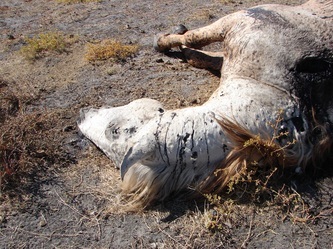 of Food and Fisheries WA in 2010, they have done nothing to apologise to the owners of the horses they killed, compensate for their loss or to solve the problem at Lake Gregory. 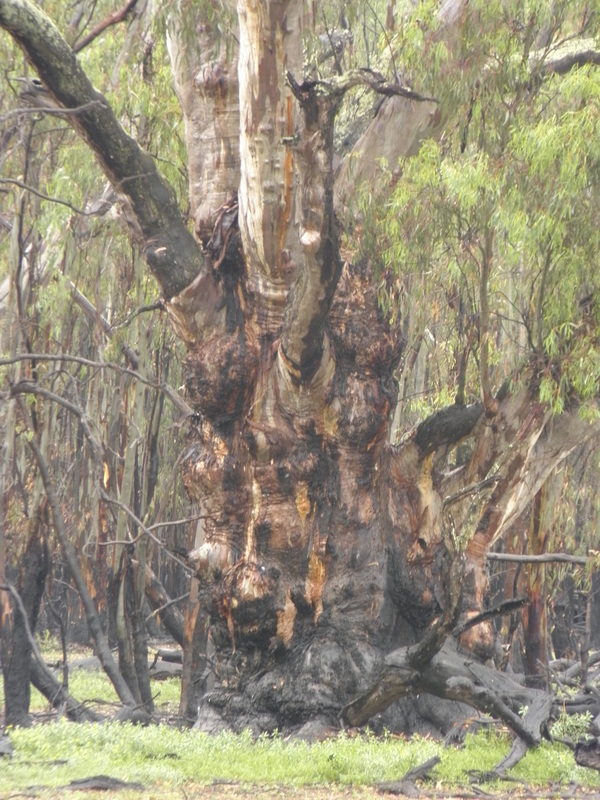 It has been allowed to happen by pure negligence by the Pastoral Lands Board, the Aboriginal Lands Trust, Dept. of Indigenous Affairs, the Indigenous Land Council, the Department of Aboriginal Affairs, the Kimberley Lands Council and DAFFWA. In 2007, the Sheik Mohammed bin Rashid al Maktoum sent his Vet to see me and after seeing the photos of the horses he went straight out to Lake Gregory and trapped 13 horses. The Sheik has the pick of the best horses in the world. He values these horses above all for his Endurance racing and is now using these horses in Dubai for breeding as well as racing. Other financiers have not picked up his lead. the numbers of horses seem constant with deaths of horses of old age and injury. However, we now hear that a cull will be conducted because there are 10000 horses there. This figure simply cannot be true. The ALT also cites horses as an environmental threat. the land, their faeces contains no seed and they walk in herds and wallow in the lake edges. We have asked that natural horsemanship training be given to the people in the communities at the lake so that they can provide trekking for tourists, that the lake be fenced and water points maintained with yards for passive trapping of some horses for gelding and medication. Nothing has been done although the ALT has agreed to these suggestions. To voice opposition to this barbaric aerial cull. The Pictures below show the reality of aerial Culling not pretty you say Disgusting well do something about it NOW!! !